Now there is old school, and then there is really old school. 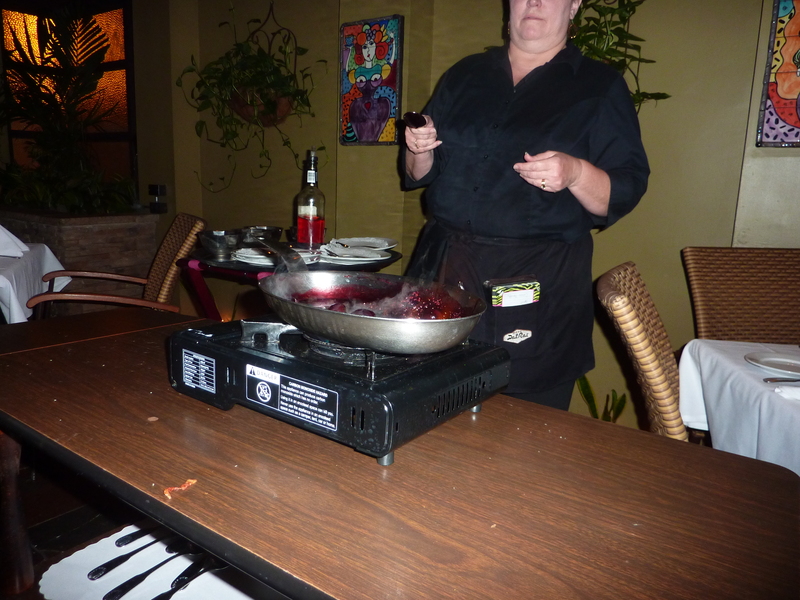 I had heard little snippets about the Dal Rae restaurant in Pico Rivera, but really didn’t know much about the place, but as Tracy and I along with friends Susan and Lenny drove into the parking lot on this Sunday afternoon, there was no doubt we were stepping back to another era. 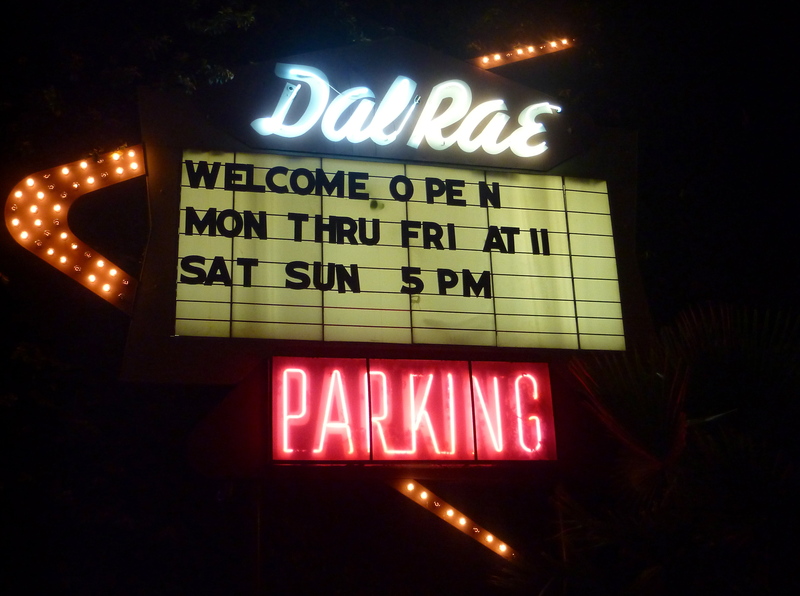 The outside of the Dal Rae is reminiscent of bowling alleys from years gone by, and this place turned out to be a restaurant right down our alley. That’s because the restaurant opened in 1958, and from the outside, you would think it was still 1958. Upon entering the Dal Rae, we were suddenly thrust into darkness, and wandering past the bar area we saw the large dining room that I hoped we would be dining in (the photo directly above and directly below are from their website). Looking at the bar area (also from their website), I thought I saw Sammy, Dean and Frank finishing a martini. Unfortunately, there was a Santa Anita racetrack event going on, so we were seated in a newer side room, which did not have the same ambiance, but once the food was served, ambiance be damned, we really didn’t care. That might have also had something to do with our drink choices. Tracy and I started with a couple of Crown Royal Manhattans ($10.50 each) while Lenny ordered a couple of Jack Daniels Manhattans ($8.95 each). Susan opted for an Absolut Mandarin on the Rocks ($10.95). Yes, this is definitely a place where cocktails rule the day (and evening). The Dal Rae dinner menu reminded me of the days when I used to go out with my parents as little kid. 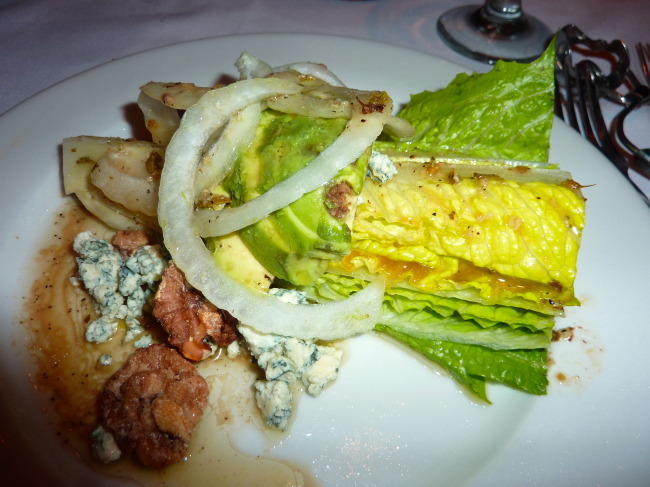 The appetizer menu includes such “old school” items as Fresh Oysters On The Half Shell, King Crab Claws On Ice, Shrimp or Crab Louie and Oysters Rockefeller. Our server first brought out a very colorful Antipasto Platter (Free). A bread basket is also delivered to the table. But that wasn’t the only bread. 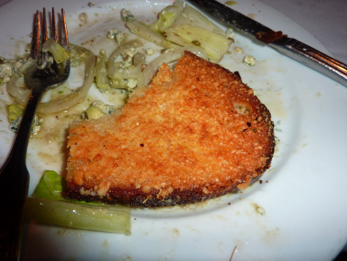 Soon, a basket of garlic bread was put on the table, and it was at this point that we stopped counting calories. Tracy started with the Hearts of Romaine Salad, with Avocado, Maui Onions, Candied Walnuts, Grated Bleu Cheese Vinaigrette ($10.95), and she was quite satisfied with the results. I helped her eat it. Salads are big enough to share here. 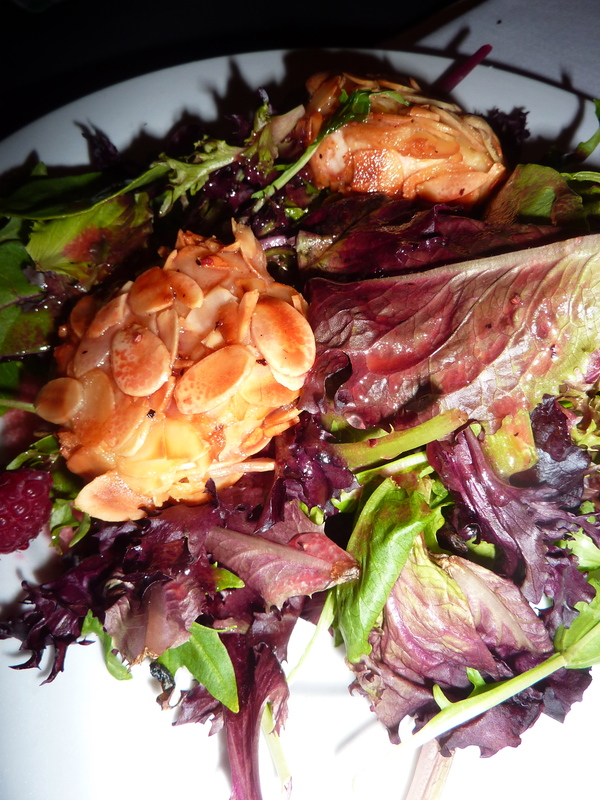 Susan began with the Baby Mixed Greens with Fried Goat Cheese ($10.75), while Lenny decided on the Baked Onion Crock ($7.95). 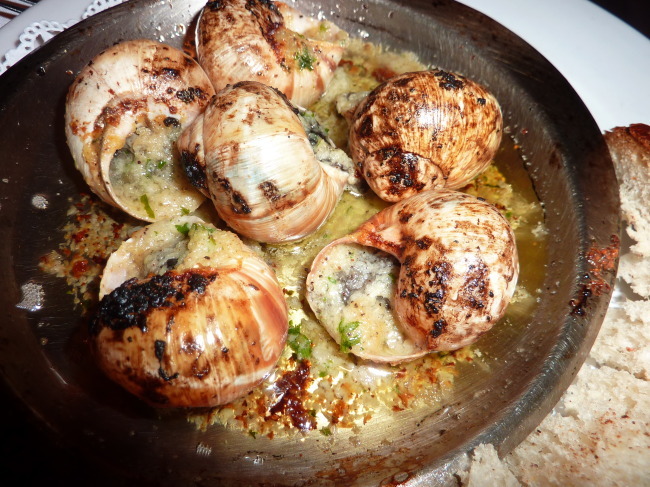 If there is escargot on a menu, I seem to gravitate toward the snail kingdom, so I, of course, ordered Escargots Bourguignonne, with Garlic Butter and Herbs ($11.95). Tremendous!! You even have to eat ‘em old school by prying those little bastards out of their shells without having them shoot across and hit the person at the table next to you. Tracy and Susan went with a variation of Dal Rae’s signature dish, a 10-ounce Petite Filet Pepper Steak ($34.50). Lenny went for the Large (16 ounce) Prime New York Steak with Madagascar Peppercorn Sauce ($46.50). Hey, I never said this place was cheap. 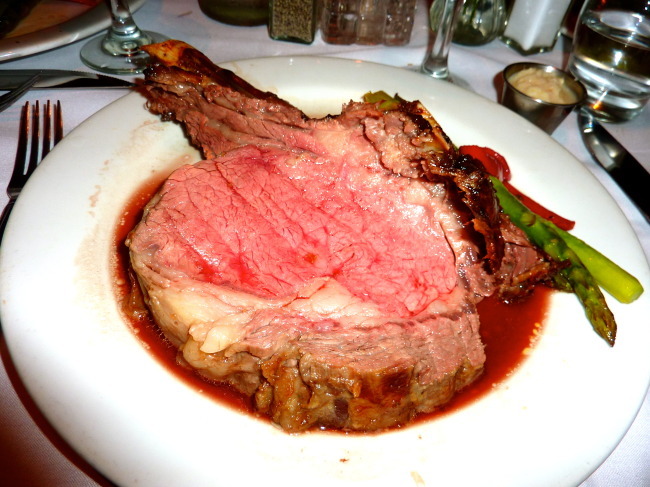 It has been my goal for the past 50 years to find a piece of prime rib that equals or surpasses Lawry’s The Prime Rib in Beverly Hills. On this night, the impossible finally happened. My Regular Cut, Medium Rare Eastern Prime Rib of Beef, with au Jus and Hot Horseradish ($42.00) that I specially asked for, equaled or exceeded Lawry’s in taste. 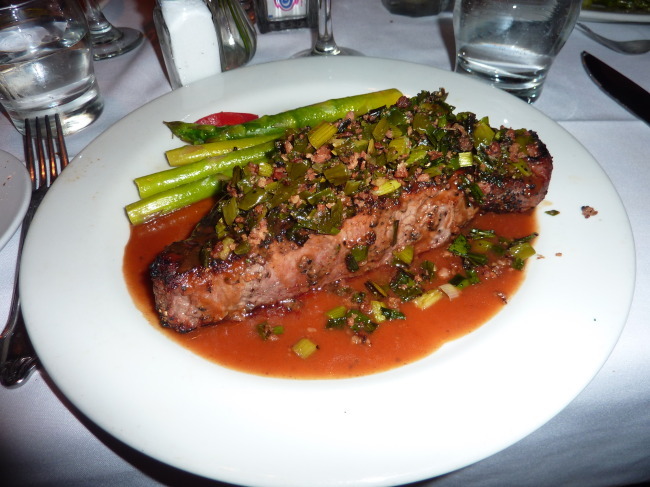 It was absolutely an incredible cut of beef. I was in cow heaven (as was my donor). 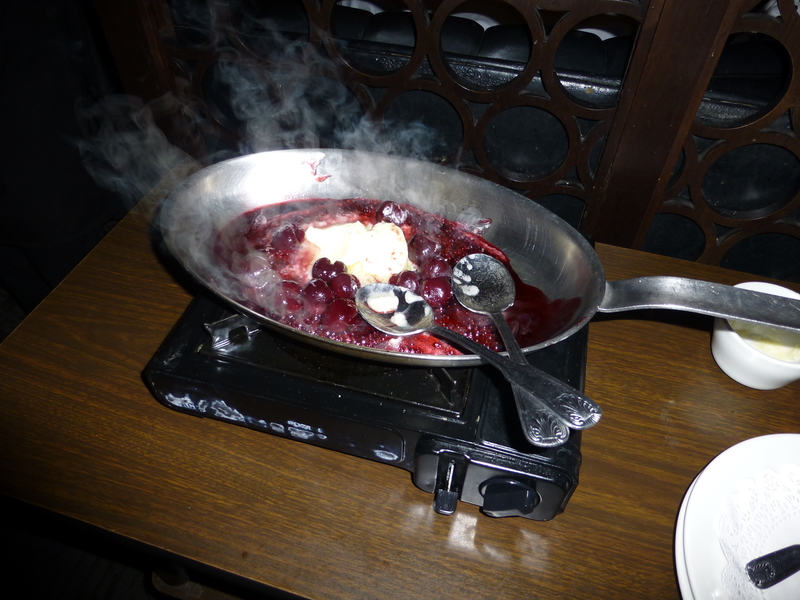 We were going to all skip dessert, until something jumped off the menu, a dessert I had never had before in my life. Plus it was prepared table side, I’m a sucker for fire, and this dessert was going to be flambéed, baby! So damn those calories and full gorging ahead. 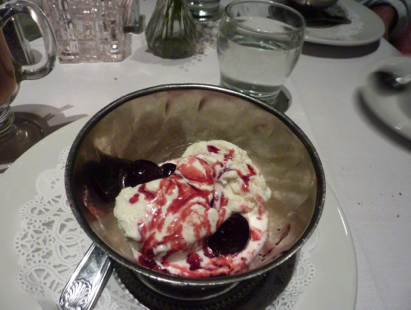 It was time for my first experience of Cherries Jubilee (2 servings at $9.75 each). 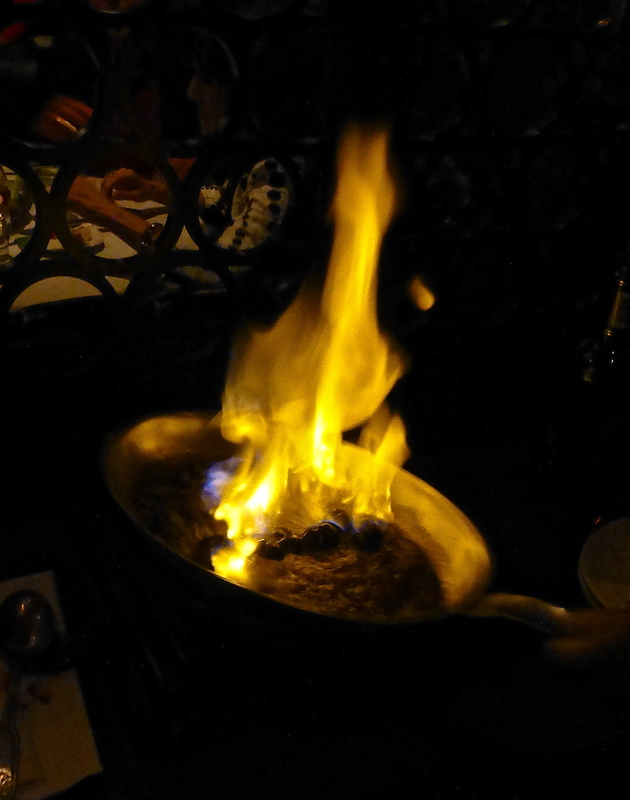 As the flames arose near us, I knew we were in for a great dessert. 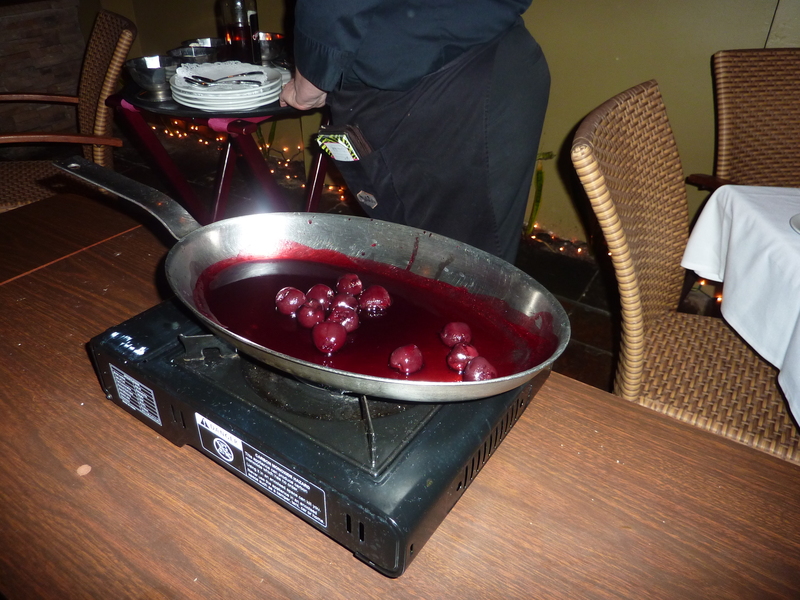 What a great ending to the meal…almost. The Irish Coffees ($7.95) capped off a great St. Patrick’s Day dinner. As I said, the Dal Rae ain’t cheap. Fortunately for us, Lenny and Susan surprised us by paying for dinner (St. Patrick’s Day is the anniversary of when they met). 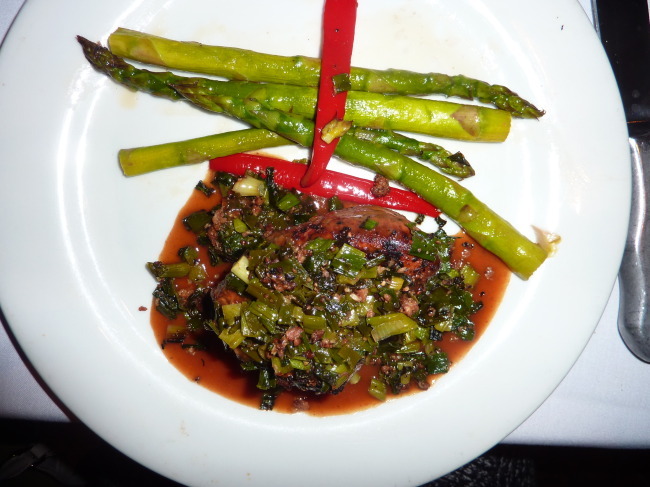 The bill (with tip) came out to roughly $200 per couple, and would have been worth it even if I had to pay for the meal. 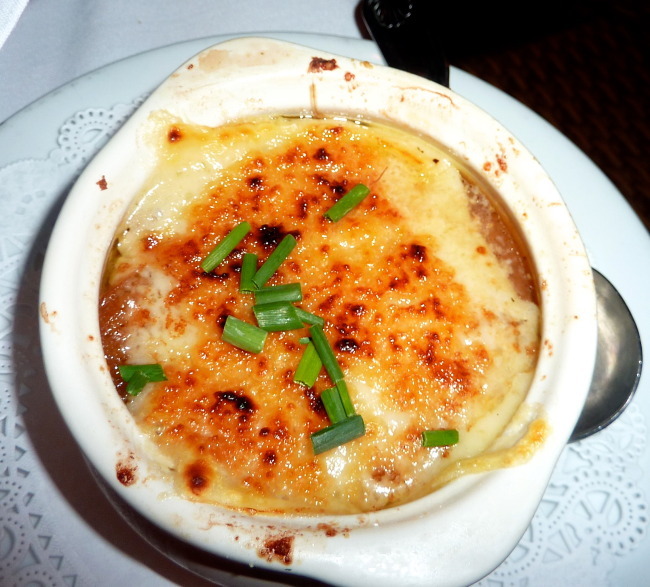 As a matter of fact, the Dal Rae is now on our short, short list of places to return. 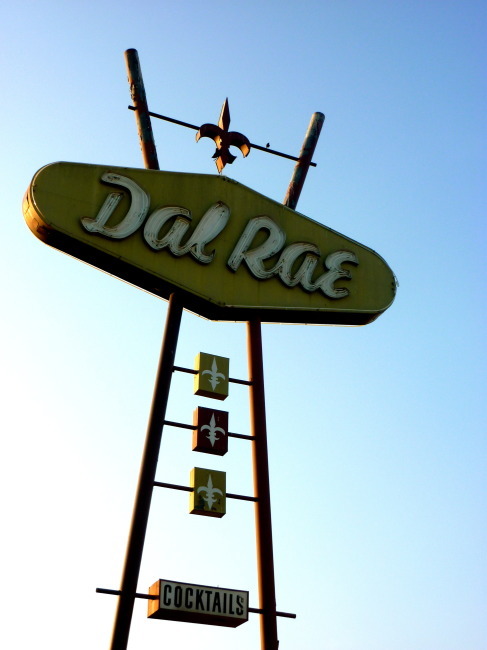 Out in the night air, we looked at the Dal Rae sign one more time. “Old school never tasted so good,” I said. 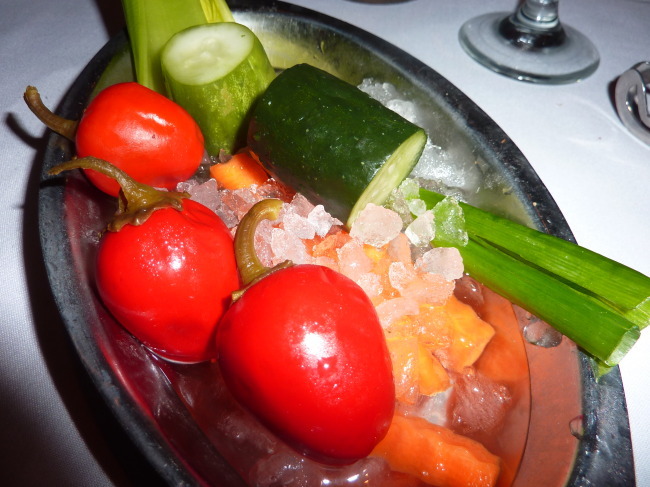 Lunch Monday – Friday: 11:00 a.m. – 4:00 p.m.
Dinner Nightly: 5:00 p.m. – 10:00 p.m.